Longford Athletics Club had five of their talented U20 athletes take to the track on Sunday 27th January for the first National Indoor Championships of the New Year. The Junior category comprises athletes aged 16-19 years making it a real challenge for older juvenile athletes with three age groups competed together in one category. They impressed across the board in middle distance and field events winning All-Ireland gold and two silver to get 2019 off to a flying start for the Club. The standard of Irish indoor middle distance running went up a notch as three new CBP were set on the day in the 1500m event in both Junior Women’s and Men’s races and the U23 Men’s as well. Seventeen runners were lined out for the start of the Junior Men’s race with Cian McPhillips in the back line inside lane 1. This was ideal as Cian shot to the front of the pack as he came off the first curve tight to the inside lane to take the lead which he never relinquished throughout the seven and a half laps around the track. He immediately took a 30 metre lead and by the first lap he had stretched his lead to 50-60 metres, essentially running alone for the rest of the race with no threat from the rest of the field. He worked hard the final two laps and the crowd could see the determined strong push to finish with a new CBP at 3:54.77 minutes breaking Kevin Walker’s 1996 record of 3:55.51. No one else crossed the line in under 4 minutes. 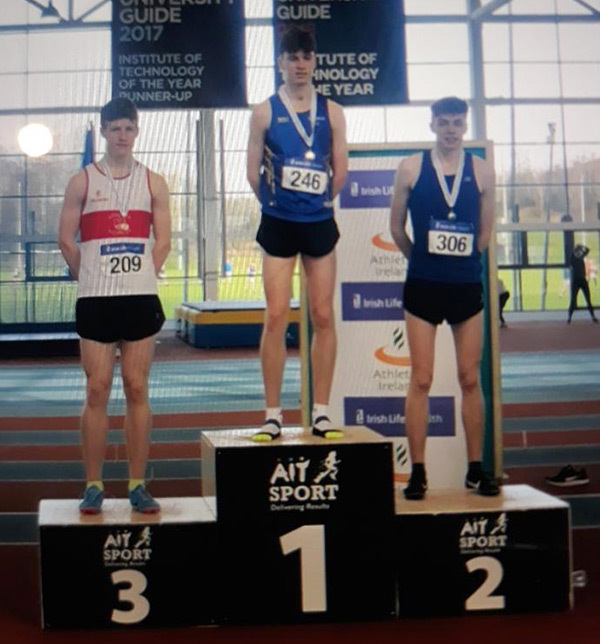 Cian McPhillips, Longford Athletics Club, on the podium at the Irish Life Health National Junior Indoor Championships at AIT winning gold in the Junior Men’s 1500m race and setting a new CBP at 3:54.77. Cian broke the 1996 record of 3:55.51 minutes held by Kevin Walker, Newbridge. Pictured along Cian are 2nd place Jack O’Farrell, Burren AC, 4:03.07 and 3rd place Jack Maher, Galway City Harriers AC, 4:04.40. Adeyemi Talabi had a busy morning session as she competed in two events. She finished second in her sprint heat at 7.79 seconds to qualify for the Junior Women’s 60m final later in the afternoon. It was then on to the Long Jump with her third jump at 5.24m securing a Silver medal. This was a good opportunity for Yemi to continue fine tuning her technical skills in this event with four of her six jumps were over 5.1m. This was her warm up for the upcoming Connacht Juvenile Indoor Championships and qualification to Nationals where she will be aiming to replicate her 6.02m jump from last summer. Yemi didn’t get much of a break as the timetable was moving ahead of schedule and she was straight back on the track for the sprint final. She clocked 7.80 seconds to finish sixth place overall in a very talented line-up including Dundalk’s Patience Jumbo-Gula who took the silver. As the 200m and High Jump events always clash on the programme timetable Nelvin Appiah ran the 60m sprint finishing second in his heat at 7.26 seconds but did not qualify for the final. He then turned his attention to the Junior Men’s High Jump which had eight competitors. Three were knocked out by 1.85m so the bar inched up higher. 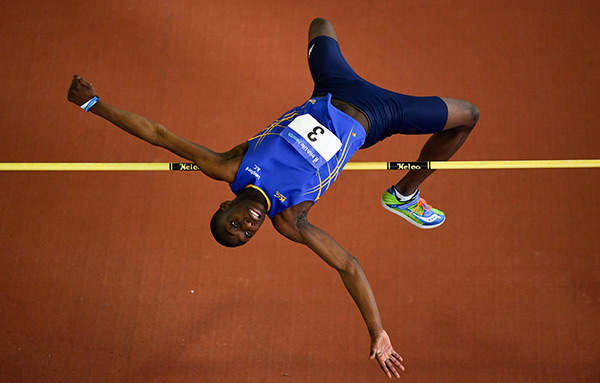 Although it took a few attempts Nelvin cleared 1.93m and 1.96m but he could not soar over the 2m bar on this occasion. In 2018 Nelvin won Gold in this event at 1.90m and he made his way to the podium for Silver this year. Aaron Kelly and Gospel Idahor were also in action for Longford in 60m and 200m events and can utilise this event at the start of the indoor season to gage their progress over the next two months with upcoming Connacht provincial Championships at the end of February.